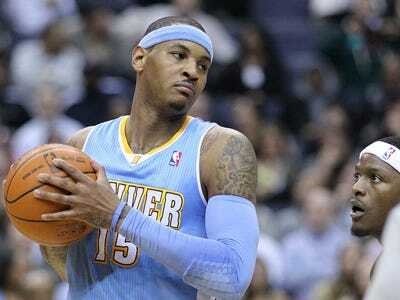 Carmelo Anthony is bound by contract to the Denver Nuggets until this summer’s free agency period. The NBA is threatened with a lockout, and uncertain CBA terms, before this period starts.Meaning, aside from the usual concerns about a current team being able to offer more money, the Nuggets are here the only team able to guarantee Melo the kind of money NBA players make now. No one knows for sure what happens if the CBA expires, or even if an agreement is reached before the witching hour. But one thing’s for sure: Anthony, if he’s worried about keeping his paper right, will sign a deal now, before the owners’ moaning and groaning forces the player to pay for their incompetence and and lousy hires. In any other year, Melo’s thinly-veiled desire to leave would be lowering his trade value by the second. Unless, it seems to be climbing. The bidding war for Melo has built into it the caveat that, if worse comes to worse, Anthony is probably more likely to sign with the Nuggets again then chance free agency. What happens next season is anyone’s guess, but short-term, that’s the nuclear option. Denver is not seriously considering a nuclear option with Anthony, which would involve telling him the team will not trade him to new York and also won’t give him the extension — making New Jersey the only path to the money for Anthony. That option, sources say, would reflect poorly on the organisation and could hinder its future dealings with players. It’s true, if the Nuggets were to withhold even their own extension, they could essentially force Melo’s destination. But this would be an almost unprecedented act of jerkiness. It might get the Nuggets what they want, but if there’s to be life after Melo, this tack certainly wouldn’t be prudent.